I saw these pictures of my nephew and his sweet girlfriend on Facebook. 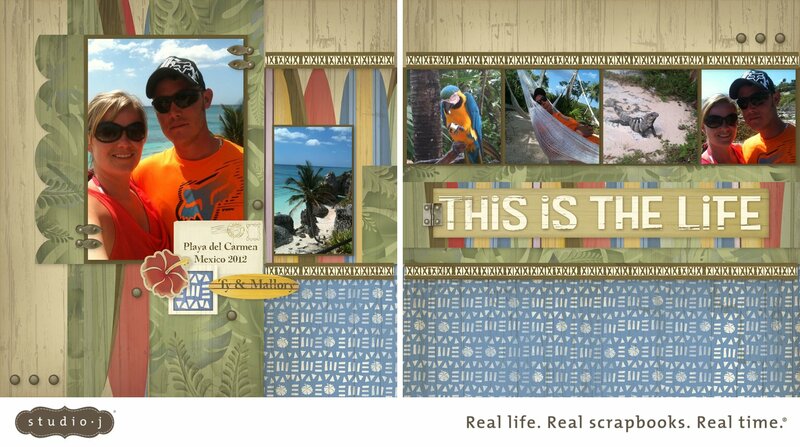 Don't you love being a scrapbooker? I so enjoy this hobby and love putting pictures to paper! This happens to be a Studio J layout because I wanted to use the Moon Doggie paper. Have you ever taken a peek into Studio J? I love all the different paper packets. Some are exclusive to Studio J, and I think that's fun! Now I have this layout saved, and I can make copies for my nephew, my sister, and myself. Pretty cool! This is so awesome! Mallory will love this! The colors are perfect-it's just such a beautiful layout! Your layout looks great! I wish I made layouts more than twice a year. I had a good goal to create one a month. I am hoping this summer I will be able too. I just need to set my mind to it and then follow through. This is so cute! I'll have to check out Moon Doggie, I see it has a wood grain paper! There's so much to choose from on Studio J. Thanks Brenda! LOVE that Studio J...and I especially love that we have access to old kits like Moon Doggie. What an awesome layout you've created! Brenda you did a great job pairing these photos with that paper packet. I hope to explore Studio J over summer vacation. That is really neat that you can make the copies to give to family.